Taking Their Place: A Documentary History of Women and Journalism charts the journey of women in U.S. journalism from colonial to contemporary times. It presents the struggles of women journalists and the contributions they have made to their field-often with excerpts from their own works so they can, in a sense, speak for themselves. Intended as a primary textbook for courses on women and journalism or on women and media, the book also can serve as a supplemental text for courses on journalism history or on mass media and society. Its approach, which links developments in the history of women in journalism to broader social changes and historical events, also makes it suitable for use in women's history classes. We initially set out to collect material that described women's efforts to overcome barriers to their participation in journalism. Our intent was to make women students more aware of their professional heritage, which many journalism textbooks overlook. Taking Their Place details historic efforts by women to be taken seriously as journalists. It describes the context for women and journalism today, including the impact of the women's liberation movement of the 1960s and 1970s. Our documentary approach also illustrates the way language, journalism and journalistic styles have changed over the years, along with expectations regarding women's place in American life. We have a twofold aim in preparing this updated version. One is to take advantage of recent historical research that offers a fuller picture of women's participation in journalism. The other is to give students more insight into the changing media environment of the twenty-first century, in which electronic publication and a more diverse population are increasingly important. As authors/editors we are grateful for the reception that has been given our past efforts to chronicle women's progress in journalism. We hope students and teachers will find that this edition of Taking Their Place further enhances their understanding of journalism history from a women's perspective. First-person articles by some of the best-known and most fearless women in journalism history. These continue to offer compelling reading. Here we have "Nellie Bly" (Elizabeth Cochrane) reporting on her race around the world in less than 80 days; Ida B. Wells-Barnett speaking out against the horrors of lynching; and Ida Tarbell explaining how she felt when she met John D. Rockefeller, the target of her muckraking exposé of the Standard Oil Company. First-hand accounts of struggles against gender and racial discrimination. Among these are Jane Swisshelm's recollection of male reaction to her presence in a newspaper office in the 1830s; an oral history interview in which Marvel Cooke recounts going undercover to expose the Bronx "slave market" for a New York newspaper in the early 1950s; Ethel Payne's recollection of working in segregated Washington, D.C., during the same time period; war correspondents' accounts of covering the Vietnam and Persian Gulf Wars; and Christine Brennan's 1988 description of interviewing the Washington Redskins in their locker room. Women journalists' reports of major events around the world. These include Margaret Fuller on the 1849 siege of Rome, Winifred Black ("Annie Laurie") on a disastrous 1900 hurricane in Texas, Rheta Childe Dorr on a women's regiment fighting in the Russian Revolution in 1917 and Marguerite Higgins on the liberation of Dachau in 1945. Editorials and feature stories on major social issues. These include an 1868 editorial on prostitution, by Elizabeth Cady Stanton; an 1873 column, by Sara Clarke Lippincott ("Grace Greenwood"), criticizing corruption in Congress; and a 1946 description, by Agnes Meyer, of migrant labor conditions along the Rio Grande Valley. Documents illustrating the evolution of traditional women's magazines and the rise of a feminist press. These include an 1853 editorial on women's roles in Godey's Lady's Book; a staff report on the founding of Ms., the first major national feminist magazine, in 1972; and a 1989 panel discussion among traditional women's magazine editors about the content of their publications. Materials on alternative women's media and women's challenges to mainstream media. Some of these materials are particularly difficult to find elsewhere. For instance, the book contains a description of principles of feminist journalism by Dr. Donna Allen, founder of the Women's Institute for Freedom of the Press, and Martha Leslie Allen; critiques of traditional women's magazines that highlight their power to influence women's self-images; a petition to the FCC by the National Organization for Women to deny a broadcast license renewal to WABC-TV in New York; and a press release on the settlement of a gender-discrimination suit at The New York Times. Reports on recent efforts to change media coverage of women. Among these are excerpts from USA Today's style guide and guidelines for reporting sexual assaults. With this new edition, we have continued our efforts to make the book speak directly to students. In response to adopters' requests, we have shortened the general introduction, focusing it on highlights of women's efforts to attain full participation in journalism, in favor of providing more explanation and context for the documents as they are presented. For the first time we have grouped the individual chapters into five roughly chronological parts, representing the colonial to the contemporary periods in U.S. history. Each part begins with an introduction that links the chapters it contains to larger issues affecting women in American society. Women and public affairs. We have added excerpts from Eleanor Roosevelt's women-only White House press conferences; a notable New York Times column by Anne O'Hare McCormick, first woman to win a Pulitzer Prize for journalistic correspondence; and a selection from the autobiography of Katharine Graham, former publisher of The Washington Post, in which Graham describes the extraordinary Post coverage of the Watergate scandal that led to President Richard M. Nixon's resignation. Women war correspondents. New material includes documents and dispatches by Margaret Bourke-White, a Life magazine photographer and World War II correspondent; Ann Stringer, a World War II correspondent for United Press; Marguerite Higgins, who received a Pulitzer Prize for war correspondence during the Korean conflict; Marlene Sanders, one of the first women to report on the Vietnam War for a major television network; and Molly Moore, a Washington Post reporter who covered the Persian Gulf War. Women and racial issues. We have added a sample of the Pulitzer Prize-winning work of Hazel Brannon Smith, a small-town editor in Mississippi who risked personal danger to speak up for racial justice, and a selection from Jill Nelson's memoir of her experiences as an African-American women journalist at a predominantly white news organization. Women and changes in journalism institutions. The new edition includes an oral history interview with Vivian Castleberry, an award-winning Dallas editor, on efforts to make women's pages in newspapers more relevant to women's lives, and an account by Helen Thomas, veteran White House correspondent, on her struggle to gain admission to male-only press organizations in Washington. Women and current journalism practices. The new edition includes discussions of newsroom dialogues to promote nonstereotypical news coverage, descriptions of efforts to redefine news to make it more inclusive of all facets of society, and documents on gender and career barriers. Illustrations. Drawings and photographs of 18 women journalists provide visual stimulation and help bring history alive. Timeline. The timeline is designed to help students grasp the overall progress and context of women's advancement in journalism. Every effort has been made to organize the material so it will be easily accessible to students. The documentary material is presented in a total of 24 chapters, along with succinct explanations to guide students in understanding the relationships and continuities among the documents themselves. The five major parts of the book, as well as the chapters themselves, represent self-sufficient units and therefore offer flexibility to individual instructors in preparing course syllabi. The general introduction sets the stage for the book. It points out women's significant contributions to American journalism. It also calls attention to women's efforts to fight for equality by pushing for improvements in the portrayal of women in the media and taking legal action to wipe out discrimination in hiring and promotion. The individual parts of the book roughly correspond to periods in U.S. history. Part I, Reaching a Young Nation, deals with the colonial and pre-Civil War period. Part II, Voicing Women's Experience, covers the mid-nineteenth century, the era of the Civil War and its aftermath. It draws attention to the establishment of separate publications for women-from those that promoted the ideal of the "lady" to those that pressed for women's rights. Part III, Making a Place in Spite of Obstacles, goes from the late nineteenth century to the mid-twentieth century and includes the civil rights movement, showing the fortitude with which women pursued journalism careers in spite of prejudice. Part IV, Seeking Empowerment, moves through the last part of the twentieth century, detailing feminist challenges to mainstream media. Part V, Envisioning Greater Opportunity, brings the story of women in journalism up to the present and discusses what is needed to truly enable women to take their place in journalism. In editing the documents, we have tried to interject as few comments as possible so as not to impede the reader; brackets indicate our insertions. We also have used the capitalization and spelling in the text of the original documents, except when they might confuse readers. The only style changes made within the excerpts have been to italicize the titles of books, magazines, newspapers, and broadcast programs, for the sake of clarity and comprehension. It is only by studying the past that we can understand the present and plan for the future. We, the authors/editors, hope that Taking Their Place will serve to give students a better sense of the courage of the women who have gone before them. If, as a result, students realize that they too can make a substantial contribution to their chosen field, we will feel well rewarded. First of all, we want to acknowledge our debt to Dr. Donna Allen, founder of the Women's Institute for Freedom of the Press, who published the forerunner of this book in 1977. It was titled Women and Media: A Documentary Sourcebook. Dr. Allen saw the book as a way of making women's experience in journalism available to students, at a time when enrollment in schools and departments of journalism was changing from predominantly male to predominately female. Recognizing that most journalism textbooks and teaching materials still tended to overlook women, Dr. Allen inspired us to collect material that described women's struggles to be allowed to participate fully in the field of journalism. 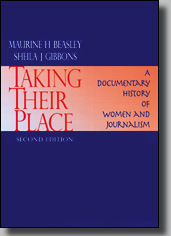 In 1993 our book appeared again, this time with a new title, Taking Their Place: A Documentary History of Women and Journalism, published by the American University Press. Expanding on themes presented in the earlier book, this edition offered more explanation and context for the documents it contained. In preparing this revised edition we are appreciative of comments made by the following reviewers, all of whom have experience using the book in their classrooms: Tracy Gottlieb, Seton Hall University; Richard W. Lee and Mary J. Perpich, South Dakota State University; Ramona R. Rush, University of Kentucky; and Rodger Streitmatter, American University. Copyright © 2003 Maurine H. Beasley and Sheila J. Gibbons.